We are probably all aware of the relative age effect in competitive soccer, but you might not be aware of how strong this effect is. 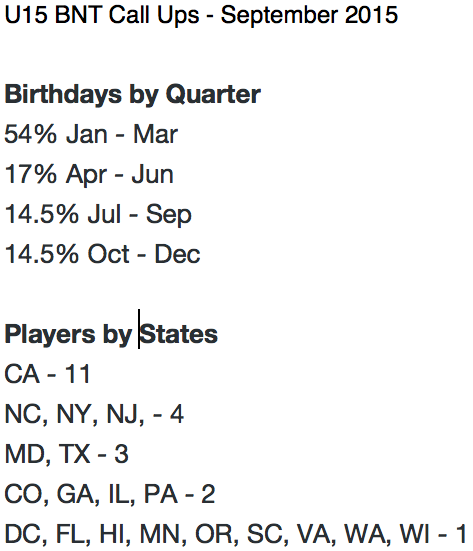 Below is some interesting data for the U15B National Team courtesy @24x7soccerus. Note that this is typical of all age groups here in the US and also in Europe. However, it’s interesting to note that the relative age effect is weak for elite female players (ECNL) as the below presentation from US Youth Soccer shows. CLICK HERE for US Youth Soccer presentation on the relative age effect. Data for both U.S. and Europe, male and female players. Previous article	← What’s in your toolkit? Very interesting James. So Sammy is born October 5th- soon moving to be one of the younger players- when is Kayleens birthdate? Kayleen is also October and will have the same challenge as Sammy. She will be one of the youngest in a year from now when the switch happens. But the good news is that the relative age effect has less impact for top girls according to the US Soccer presentation that I link to in the post.